IT'S a blissful life for Pam Sellwood's golden retrievers. They spend their Thursdays helping children to read, and getting all the attention their hearts could desire. Now, Ms Sellwood has published a book about her younger dog, Chevy. Chevy the Story Dog began from many students' questions about Chevy and his mother Marlee, Ms Sellwood said. “Chevy has been going for 18 months but his mother has been going for three years,” Ms Sellwood said. On Thursdays, the dogs take a trip to Pottsville Beach Public School, then St Anthony's in Kingscliff. 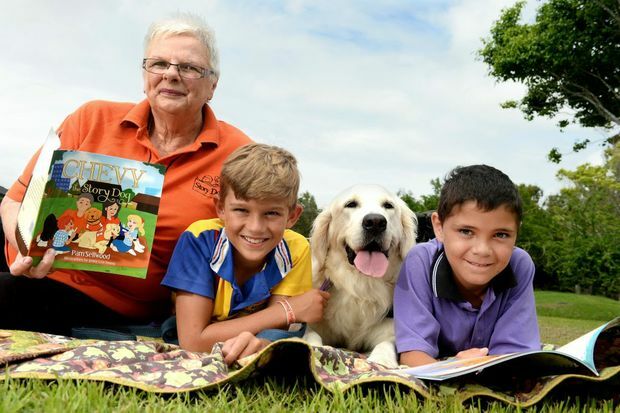 They – and Ms Sellwood – volunteer for the non-profit organisation, Story Dogs, which was established in Murwillumbah in 2009. The program is designed to help children in Year 2 with reading difficulties gain confidence in reading. Ms Sellwood, who has a background in dog training, said it was a great way to give back in retirement. “The teachers are really good with the program,” she said. “The children really improve … By the end of the year they're really outgoing and are reading really well. Ms Sellwood said the dogs enjoyed their Thursday adventures at the schools, too. “The dogs love it,” she said. Ms Sellwood said it was incredibly rewarding to see the children improve with their reading after being involved with the Story Dogs program.